The other day, a reader asked whether am I the one who wrote the blog. Mamarazzi replied that she helped me write as a form of diary for me. Anyway, last blog post I did sort of write it . Well, at least I helped editing some of the photos. Yea... now it's me who teach Mamarazzi how to edit photo instead . Am wondering how is General Election done in other countries? For as long as I know , each time GE approach there will be flags and posters "wars". Yup... Flags and poster symbolising each competing party will be everywhere along the road side. After the GE, each party have to clean up the place. 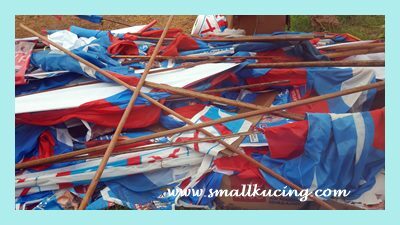 Take out all the flags and posters or else they will be fined a sum of money. Anyway. it's also a happy time for gardeners. Yup, most gardeners would be eyeing the bamboo poles, wood, canvas and pipe for the D.I.Y projects in their garden. They cannot take those during the campaign period as it would be an offence that will land them some jail time. But after election, most will "help" the party to clean up. Mamarazzi's lucky day last weekend. 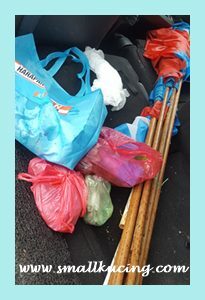 Managed to get some discarded poles and flags. Yea...flags as remembrance of the momentous moment. A funny incident happened. 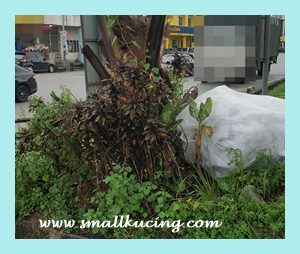 As she was collecting the poles, a man came down from his motorbike. Mamarazzi thought the man is one of the party member . And that man thought she was one of the party member. Apparently, both of them aiming for the same thing. The man wanted some flags as a memento. Managed to get around 10 poles and some flags. 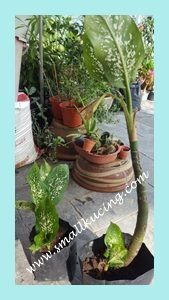 Yesterday evening, Mamarazzi rescued some Dumb Cane from the roadside dumpsters. Poor plants. They might have been dumped due to their reputation of being poisonous to pets and child. Oh come on! Poisonous? Yes, it's poisonous if you consume it. 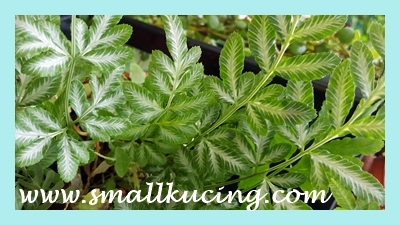 Even cats and dogs would avoid this plant as the sap have stinky smell. It's one of the plant protective systems again while animals. As for toddler, ones just have to be careful where the plant is placed. For me, I dislike eating vegetable. I definitely won't go and eat that. Anyway, these are the rescue beauties. Hopefully under her friend's care, they will prosper. Our garden is blooming. The Kesidang (bread flower/vallaris glabra) is flowering at every branch. Garden is full of lovely pandan/screwpine scent. The desert roses also decided to join in the competition. Never have I seen so many pots blooming at the same time. 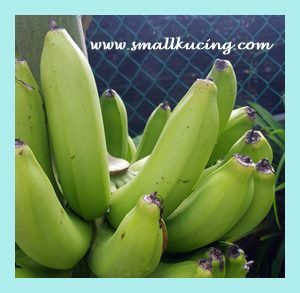 How long does it takes Banana from fruiting to ripe? Ours seems to take forever. It have been there since the end of January. Yesterday Mamarazzi noticed that the top ones are rounded and one even splits its side. But the bottom most are still pretty skinny. .
And these are green skinned Banana. It won't turn yellow. She just put a lot of fertiliser yesterday. Hopefully by next week we can enjoy the banana. Well, the weekend is here. Happy weekend to everyone and have fun!. Hello, I hope you are enjoying working and writing for the blog. I like all the pretty plants and flowers. 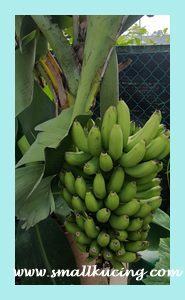 It is nice to grow the bananas, I love them. Enjoy your day! 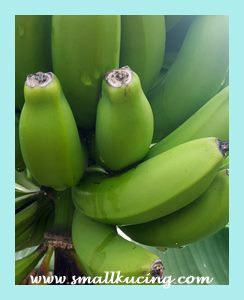 Great to see your garden blossoming and hopefully you will tell us how sweet the bananas were too in your next post! Love all the beauty from your garden! And collecting momentos from the election is a great idea! We have the same issues here after an elections. Signs everywhere and they threaten to fine you, but I don't think it happens. You are an amazing gardener. How interesting - that is something I have not had time for yet. I was thinking too - those huge flags would make very nice bed sheets but no, I did not go out to grab any. :D Wowwww!!! Those bananas are huge! I think they chop them off like that...and then it will turn yellow and ripen, not sure. Wah. Never knew you can take the poles after election. If I know, I will help myself to some. But over here, they really clear and clean up those stuff. Hardly any pole left. Haha. Your garden is getting more beautiful and colourful. And fruitful too. Beautiful garden thanks to Mama's green fingers.! This blog post has always been very humorous when we know how the writer and the son look like exactly. Somehow I think this is the most beautiful diary for the Small Kitten to read when he has grown up into an adult Tom Cat. He will appreciate all the love, time and sacrifices both his parents have showered him. This blog memories will live on forever for many generations. I was also tempted to collect all the 3 types of party flags for keepsake or make them into coffee table cloths. I was too slow as all kena rampas and left only BN. I told myself the BN flag might bring me bad luck and walked away. So many good things happening in your garden. My mom also wanted the poles but the only ones in my area were in the middle of the main road! Decided not to risk it haha. Yep I also go broke if plant banana for a living. Too ages to fruit, then ages again to mature. It was a battle as squirrels were always around the bunch. Ended up lost a few to squirrels and managed to harvest the rest. Not pretty as many of the skins had split earlier. But can eat the fruit. Oh I see...take the pole for the garden. I did not think of that. Next GE I go sapu LOL! I actually thought of collecting some bamboo poles after the election was over but was too busy to do so. Now they are all gone! Wah your garden is blooming with beautiful flowers! Love the desert roses and of course the big fat bananas! Wahhhh mamarazzi so busy upcycling those poles & flags. Loving your enthusiasm for gardening. I indeed am admiring the produce and beauties. All of your plants look so healthy! mamarazzi, tell me what you want to do with the poles and flags. I saw many ideas in FB, some recycle the flags into bags, dress and etc. Nice garden there! Good idea to recycle the poles. Btw I saw there's still a few vehicles in KL displaying Pakatan's flag. Seems like the patriotism spirit is pretty high! Wow, you do understand politics. 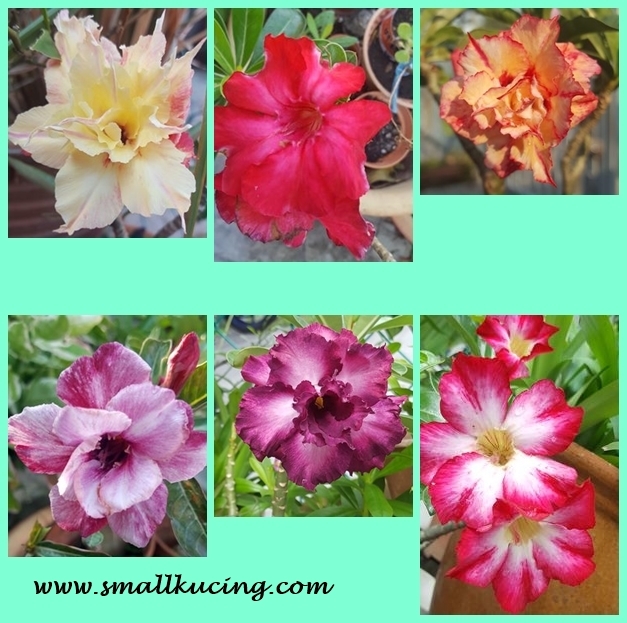 Waaa...so happening one your garden - many beautiful flowers to brighten the home. All feel-good like that. Wow, you have such lovely green fingers! Everything growing so well.